Succesfully made the mode, all went smoothly, only at the end to remount the sidesliders, a little sanding was needed. Thanks richardclli for the tuto and the file of the parts. Started this rainy afternoon at 14:00 and at 18:00 all was finnished. Last edit: 31 Dec 2017 17:42 by jejeg. Successfully installed gimbals on Devo 10. Used only 2 big printed parts. Had to cut off a little bit so they fit. Didn't use 3d printed "pressure plates". Instead everything together using glue E6000. 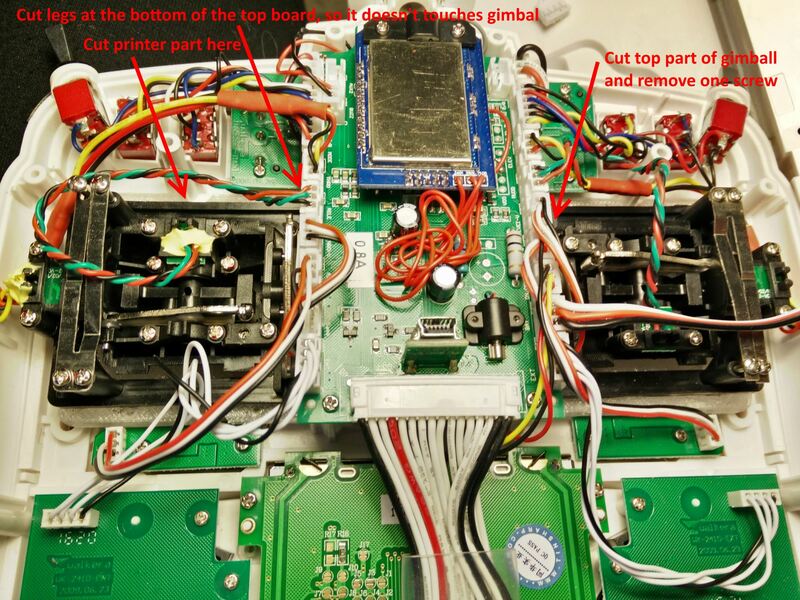 Had to trim some plastic from gimbals where they go under top central transmitter board. Also removed one screw from one of gimbals. 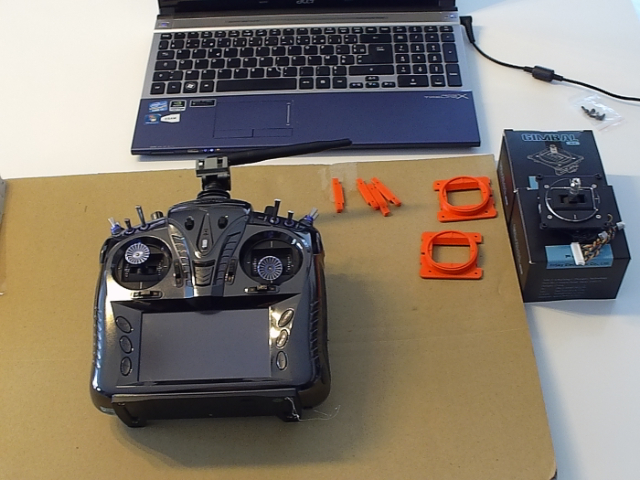 Cut off some connector legs from underside of top transmitter plate, otherwise it was touching gimbals. Also had to rotate ALL four magnets. Also had to extend 2 set of wires - one on each gimbal, otherwise they didn't reach connectors. Can you tell me if it's easy to turn the magnets and how to adjust? 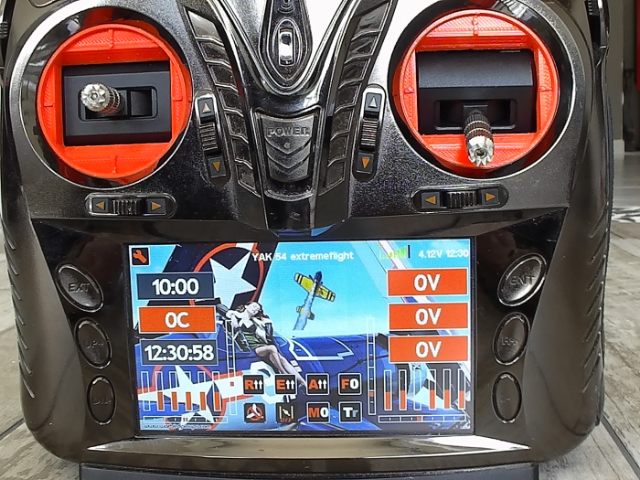 First of all it is much easier to rotate and adjust magnets when gimbals are not glued or screwed into transmitter. But of course they should be plugged it. So it is not a big deal if you did glued gimbals in. 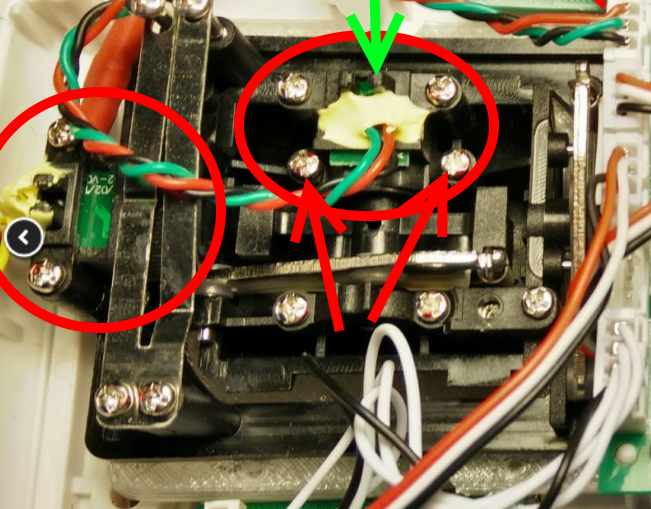 Magnets are under assembles (small circuit board and plastic casing) circled in red. You need to remove 2 screws to lift each assembly. Screws are marked by red arrows for top assembly. Left assembly screws are not visible on this photo because they are covered by long metal flat springs. After removing two screws, lift assembly. Now you will see the magnet. It is where green arrow points to. You'll need to loose (no need to remove completely) another screw that holds magnet in place. switch on TX, remove all trims and see what values are displayed when sticks are centered. You want to see as close to 0 as possible. In my case I was getting up to +/- 20.
put everything back see the values. Keep doing it until you reach desired result. I was able to adjust everything to 0 and 1 after about 3-5 attempts. Thank you for all this information, as soon as I have the opportunity, I'll do it, I have all the equipment and I'll let you know. richardclli wrote: I am quite busy these few weeks. I will continue to work on Devo8S when I have spare time. I think the gimbals would fit in Devo8S even better than Devo12S, however the 3D printing parts need to be modified. Thanks for the description. This looks very good. I love my Devo 10, but a while ago it fell on the sticks and they are sometimes a tiny bit notchy, which drives me insane. So I went ahead and bought the M9 gimballs and will try my luck. One question, you wrote that you did not use the pressure plates. Didn't they fit or why? richardclli, thanks a lot for sharing the 3d model! I am very excited to get this started. This is the first time ever I have something 3D printed, so I am a little bit confused by the options. So material is ABS, but which layer height do I have to choose? 100 μm, 200 μm or 300 μm? They don't fit right away, and glue keeps front gimball parts good enough.